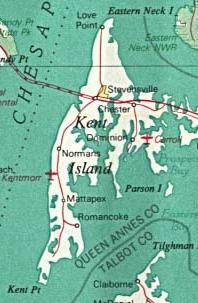 Kent Island is part of Queen Anne's County, Maryland, and Maryland's Eastern Shore region. The first English establishment on the island, Kent Fort, was founded in 1631, making Kent Island the oldest English settlement within the present day state of Maryland and the third oldest permanent English settlement in what became the United States—after Jamestown, Virginia (1607), and Plymouth, Massachusetts (1620). The census-designated places of Stevensville, and Chester are located on the island, along with several other communities, including the fishing community of Kent Narrows, which is located partially on the island. Although all of Kent Island's communities are unincorporated, the census designated places of Stevensville and Chester on the island are both more populous than any of Queen Anne's County's incorporated towns. Prior to European colonization, Kent Island was inhabited by Native Americans for nearly 12,000 years. 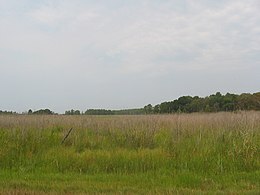 The island was inhabited by the Matapeake tribe, members of the Algonquian nation who the Matapeake area of Kent Island is named after. Other tribes that inhabited the area and often visited the island included the Ozinie and Monoponson tribes, the latter of which share their name with the Algonquian name for the island, Monoponson. During the 16th and 17th centuries, early explorers of the Chesapeake Bay, including Captain John Smith, were the first Europeans to see Kent Island; however, it wasn't until August 1631 that the island became an English settlement. At that time, William Claiborne, a resident of Jamestown, founded a settlement near the southern end of the island for the purpose of trading with Native Americans and named the island after his birthplace of Kent, England. The settlement burned down in the winter of 1631–32 but was quickly rebuilt, and in 1634 the settlement included a gristmill, courthouse, and trading station. Following the formation of the province of Maryland, Claiborne continued to recognize the island as part of his home colony of Virginia, while Cecilius Calvert, 2nd Baron Baltimore recognized it as part of Maryland. Claiborne was forced from and returned to the island twice before leaving permanently in 1658, thus effectively ending the disputes. Virginia's official claims to the island, however, continued until 1776. Today, Kent Island is considered a suburb of the Baltimore-Washington Metropolitan Area and was home to 16,812 residents at the time of the 2000 U.S. Census. The combined area of the Stevensville and Chester CDPs had 9,603 residents. Many have relocated from the Washington, D.C., or Baltimore metro areas and continue to commute back there. Stevensville and Chester are also among the most densely populated areas of the Eastern Shore, and the most densely populated in Queen Anne's County, making up 23.67 percent of its population and only 3.07 percent of its land area. The main mode of transportation on Kent Island, as with most other suburban areas of the United States, is the automobile. Kent Island's main roads include the U.S. Route 50/ U.S. Route 301 freeway, which connects the island to Central Maryland via the Chesapeake Bay Bridge and to the Delmarva Peninsula via the Kent Narrows Bridge. The island is also served by Maryland Routes 8, 18, and 552.